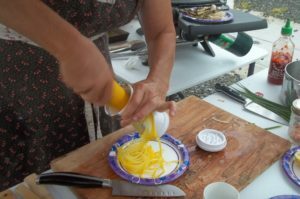 Jen and Suzanne started the day by spiralizing squash. Spiralized squash makes a really delicious pasta substitute. We tried it out on Kim Moxley’s culinary arts students and they were ALL pleasantly surprised. You can buy one online or locally at Walmart. They are about $15 for the counter top version, much less for this handheld one. Spiralize the squash. You may want to cut it-it comes out as 1 continuous piece. Saute with minced garlic with salt, pepper and cayenne in a mix of butter and olive oil over medium heat until done to your preference. You may need to add a bit of water or stock if it gets too dry. Top as you would any pasta. Chop 1 clove of garlic,1 small onion ,1 bell pepper and 1 chili pepper. 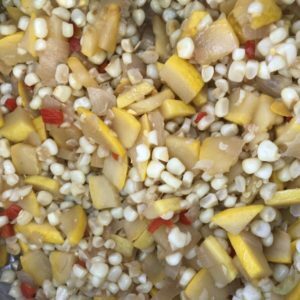 Saute in a mix of oil and butter over medium heat.When tender add 1 chopped medium yellow squash and the corn. Continue to saute until everything is done. Add salt and pepper to taste. Jen prefers the taste of ripe to green tomatoes. 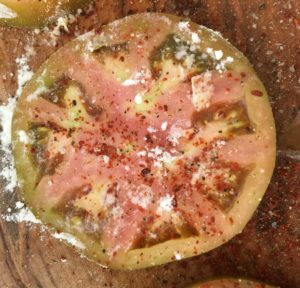 Slice and generously season the tomatoes with salt,pepper and dried pepper flake. Dreg in flour, beaten egg and flour again. You can use cornmeal. Pan fry in butter and oil until crisp and nicely browned. 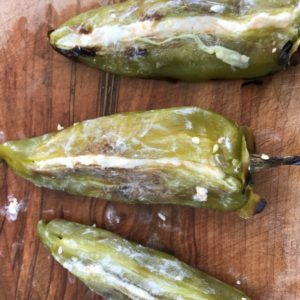 Char Anaheim peppers and peel the skins. Separate 2 eggs. Whisk the whites with a pinch of salt. When stiff add 2 tablespoons of flour and the 2 egg yolks. Mix gently just to combine. Prepare filling: mix 1 package of cream cheese with 1/2 cup each shredded pepper jack and cheddar cheeses, or 1 cup Mexican mix with a minced onion. Slit the chiles carefully and stuff. 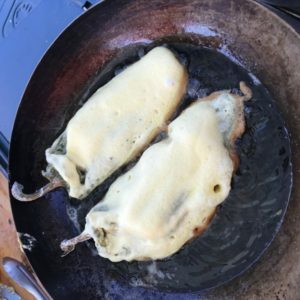 Dreg the peppers in flour and then the egg mixture and pan fry seam side down until golden. Flip and cook the other side. 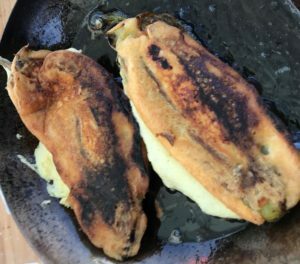 This entry was posted in Recipes and tagged cooking day, peppers, recipes, squash, tomatoes. Bookmark the permalink.